It is a fast, vigorous grower that establishes quickly and begins blooming usually in the first season The Passion fruit vine is a shallow-rooted, woody, perennial, climbing by means of tendrils. The alternate, evergreen leaves, deeply 3-lobed when mature, are finely toothed, 3 to 8 in (7.5-20 cm) long, deep-green and glossy above, paler and dull beneath, and, like the young stems and tendrils, tinged with red or purple, especially in the yellow form. A single, fragrant flower, 2 to 3 in (5-7.5 cm) wide, is borne at each node on the new growth. In Florida, blooming season is from mid-March to mid-November. The yellow form has a more vigorous vine and generally larger fruit than the purple, but the pulp of the purple is less acid, richer in aroma and flavor, and has a higher proportion of juice-35-38%. The purple form has black seeds, the yellow - brown seeds. Passionfruit vines are usually grown from seeds. With the yellow form, seedling variation provides cross-pollination and helps overcome the problem of self-sterility. This vine will do extremely well in California and Florida, and will produce fruit in colder states as well as it can be grown in a pot and brought in for the winter. Fruit: The nearly round or ovoid fruit, 1-1/2 to 3 inches wide, has a tough rind that is smooth and waxy. Within is a cavity more or less filled with an aromatic mass of double walled, membranous sacs containing orange-colored, pulpy juice and as many as 250 small, hard, dark brown or black, pitted seeds. The unique flavor is appealing, musky, guava-like and sweet/tart to tart. The fruit is a very delicious and considered one of the best tasting of the Passion Fruits. 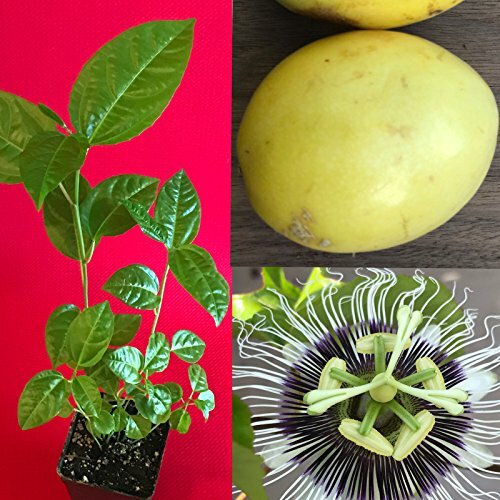 You are purchasing one 6-10'' tall (pot height is not included) Yellow Passion Fruit Passiflora Edulis Potted Seedling Tree Starter Plant in 3'' square pot. Trees grown from seeds are not identical to the parent tree. Pictures are from my garden of the actual plants and that I grew. Item location: Jupiter, Florida, United States. Ships to: United States with USPS First Class or Priority mail..
For More Information Please Read the Descriptions. If you have any questions about this product by genuineprotection, contact us by completing and submitting the form below. If you are looking for a specif part number, please include it with your message.